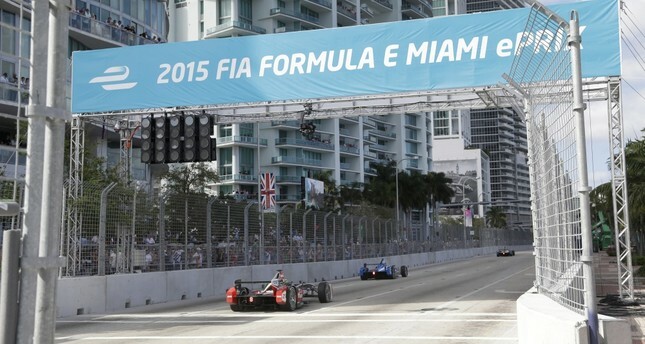 Cars race on downtown Miami streets during the Formula E Miami ePrix auto race in Miami on March 14, 2015. Formula One announced it wants to stage a street race in Miami starting in 2019 and the city commission has scheduled a vote next week on a proposal to formalize plans for a 10-year deal. The series has long sought to enlarge its presence in the United States. A Miami race would be the second in the U.S., joining the U.S. Grand Prix in Austin, Texas. It would be the fourth in North America, joining races in Canada and Mexico City. Formula One officials said if approved, the Miami race could be targeted for October 2019, which would place it close to the current calendar spot of the Texas and Mexico City races. The Miami race would be the latest move by Liberty Media, the American ownership group that took over F1 in 2017. Liberty is pushing for ways to expand F1's reach, including the possibility of adding new races in Asia, and a soon-to-launch live streaming service. The Texas race gets about $25 million annually in state and local tax money to pay F1's rights fees and other expenses. The Florida race is supported by Miami Mayor Francis Suarez and Miami Dolphins owner Stephen Ross. Suarez said he expects "99 percent" of financing for a Miami race to come from private sources with any city funds coming it at $500,000 or less. Ross helped lead the plan to relocate the Miami Open tennis tournament from Key Biscayne to the Dolphins' stadium complex in Miami Gardens, a move that will be enacted in time for next year's tournament. He's also brought several international soccer events to Hard Rock Stadium, which is seeking to host World Cup matches in 2026. The F1 plan also comes while a group led by soccer icon David Beckham tries to bring an MLS franchise back to the Miami area. Beckham and MLS formally announced earlier this year that a team is coming, but it's still unclear where the stadium for that club will be built and when it will be able to start play. Formula One races in cities across the globe but left the U.S. from 2008-2012. It returned with the U.S. Grand Prix in Texas at the Circuit of the Americas, a $300 million facility built specifically for F1. A Miami street race would be the first F1 street race in the U.S. since 1991 in Phoenix.